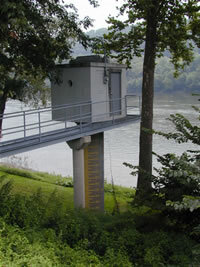 LOCATION.--Lat 40`59'38", long 76`26'25", Columbia County, Hydrologic Unit 02050107, on right bank 50 ft upstream from SR 487 bridge, at Bloomsburg. PERIOD OF RECORD.-- March 1995 to March 1997 (operated as a crest-stage gage, partial-record station, annual maximum only); April 1997 to September 2010, stage only, not published; October 2010 to September 2014, stage discharge, measurements only published. October 2014 to present, continuous discharge site. GAGE.--Water-stage recorder and crest-stage gage. Datum of gage is 451.37 ft above National Geodetic Vertical Datum of 1929. Satellite and landline telemetry at station. COOPERATION.--Station established and maintained by the U.S. Geological Survey in cooperation with the Pennsylvania Department of Environmental Protection and the City of Bloomsburg. REMARKS.--Prior to 1995, data at this station were provided by outside sources. Supplied by NWS: Action stage-16 ft; Flood stage-19 ft; Moderate flood stage-22 ft; Major flood stage-28 ft.